Yamaha has updated their website with specs for the 2019 Yamaha WR250R. Aside from new graphics, the bike looks pretty much unchanged from previous model years (all the way back to 2008), aside from the graphics. If it ain't broke, don't fix it! Yamaha just updated their website with specs for the 2018 Yamaha WR250R. Aside from new graphics, the bike looks pretty much unchanged from previous model years (all the way back to 2008). Yamaha's website now lists the 2016 Yamaha WR250R. Aside from new graphics, the bike looks pretty much unchanged from previous model years (all the way back to 2008). Yamaha nailed it with this bike, so once again... if it ain't broke, don't fix it! "Rev the WR250R and there’s plenty of power available from the four-valve Single. In our previous test the WR was head and shoulders above its Red and Green competitors, and Yamaha carries over the same mill into 2014. 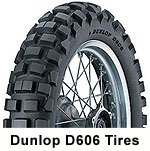 It features fully adjustable front and rear suspension with 10.6-inches travel available on both ends." "The WR250R is a great machine if you’re looking for a bike that will tackle trails and navigate street traffic with aplomb. It’s a simple package with a few choice upgrades which continue to place the WR250R at the top of the dual-sport heap." Yamaha's website now lists the 2015 Yamaha WR250R. The blue rear fender is back for 2015, but aside from new graphics, the bike looks pretty much unchanged from previous model years (all the way back to 2008). Once again... if it ain't broke, don't fix it! One of the first things most riders do to their WR250R/X is add a set of hand guards. Our favorites are the ones from Zeta Racing. We've created a package deal, which consists of a pair of aluminum Zeta Armor Hand Guards (Bend Style) and your choice of the plastic Zeta XC Protectors or plastic Zeta XC Flasher Protectors (with integrated turn signals) that bolt to the front of the aluminum hand guard. For more details and some photos, see our Zeta Armor Hand Guard Package Deal. One of the first things WR250R and WR250X owners will do to their bike is get rid of that huge stock rear tail light assembly. The DRC Edge tail light kit helps you do just that. In conjuction with a pair of DRC LED turn signals, it really cleans up the rear fender area of the bike. If your looking to replace the rear tail light and turn signals plus the front turn signals, there is a Lighting Package Deal available. If you're looking to replace that uncomfortable stock WR250R/WR250X seat, Seat Concepts seats feature a wider seating surface, as well as a more comfortable foam material. They are available in a standard height version and a low height version. The Seat Concepts WR250R Seat kit consists of seat foam and seat cover, which you install on your stock seat pan. If you want something you can bolt right onto your bike, the Seat Concepts Complete Seat for the WR250R is the way to go. These seats are a must for those long day rides or multi-day trips. Easily our best selling rack for the WR250R, the Pro Moto Billet WR250R Cargo Rack is CNC machined from a 1/2 inch thick plate of 6061 billet aluminum, and is then “hard black” anodized for durability, ease of maintenance, and protection from the elements. Stainless steel fasteners provide carefree maintenance. The rack bolts to the sub-frame of the WR250R / WR250X, and sits about a 1/2" above the rear fender. It's a must if you want to carry anything on the back of your WRR. Made in the USA! The factory lower engine protection that comes on the WR250R is pretty much worthless, so a high quality skid plate is a must if you intend on doing any off-roading with the bike. 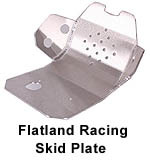 Our favorite is the Flatland Racing Skid Plate. This thing is a is a work of art. Fit and finish is first rate and the welds are beautiful. The plate itself is made of rugged 3/16" tig welded aluminum, and features a built-in clean out slot and an oversized oil drain hole, which makes draining your engine oil a breeze. We've combined this skid plate with the Flatland Racing Radiator Guard in this handy package deal. The WR250R is a pretty tall bike, so if you are slightly height-challenged like myself, the Yamalink Lowering Link is a must-have mod. Combined with the factory lowering option, it will help lower the seat height by approximately two (2) inches. After doing this mod to our WR250R project bike, I'm much more comfortable on the bike both on the street and in those nasty off-road situations. A Fuel Injection Controller, like the EJK EFI Controller, is highly recommended any time you install an aftermarket exhaust and/or intake/air filter on your 2008+ Yamaha WR250R (or WR250X). Without one, the bike will still use the stock fuel map and may run poorly, plus that new exhaust/intake won't provide any performance gains. If you're keeping your engine stock, an EFI controller is one of the best bang-for-the-buck mods. The WR250R/X runs lean with the factory fuel map and really falls on its face in the low to mid range when you hammer the throttle. A Fuel Injection Controller will adjust the fuel mapping, making the bike run better, helping eliminate that dead spot early in the powerband. You can find more Yamaha WR250R parts over at SRmoto's On-Line Store. Yamaha has added info on the 2014 WR250R to their website. The bike looks pretty much unchanged from previous model years (all the way back to 2008), except for new graphics on the tank shrouds. If it ain't broke, don't fix it!. Yamaha has added info on the 2013 WR250R to their website. The bike looks pretty much unchanged from previous model years, except for new graphics on the tank shrouds and also a new white rear fender. One of the first things WR250R owners will do to their bike is get rid of that huge stock rear tail light configuration. 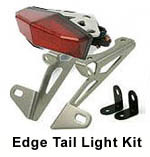 The DRC Edge tail light kit helps you do just that. In conjuction with a pair of DRC turn signals, it really cleans up the rear fender area of the bike. If your looking to replace the rear tail light and turn signals plus the front turn signals, there is a package deal available. Easily our best selling rack for the WR250R, the Pro Moto Billet WR250R Cargo Rack is CNC machined from a 1/2 inch thick plate of 6061 billet aluminum, and is then “hard black” anodized for durability, ease of maintenance, and protection from the elements. Stainless steel fasteners provide carefree maintenance. The rack is a must if you want to carry anything on the back of your WRR. Oh, and this rack is made right here in the good ole USA. One of the best "first mods" to this bike is a new skid plate. The factory lower engine protection that comes on the WR250R is pretty much worthless, so a high quality skid plate is a must if you intend on doing any off-roading with the bike. Our favorite is the Flatland Racing Skid Plate. This thing is a is a work of art. Fit and finish is first rate and the welds are beautiful. The plate itself is made of rugged 3/16" tig welded aluminum, and features a built-in clean out slot and an oversized oil drain hole, which makes draining your engine oil a breeze. We've combined this skid plate with the Flatland Racing Radiator Guard in this handy package deal. If you're looking to get rid of the big ugly mirrors that come stock on your WR250R (or WR250X), these high quality billet aluminum bar end mirrors might just do the trick. You can mount them in the end of any 7/8 bars, or remove the bar end inserts and clamp them to virtually any handlebar. On our WR250R, we chose to do the latter and removed the bar end inserts, then clamped them to the stock handlebars right near the crossbar. You can find more Yamaha WR250R parts over at SoloRacer.com.